Why people thinking freelancing very easy job? Hi when I started a freelancing career on 2008-09 on oDesk (upwork) and freelancer dot com, many of people asking me what I do online 24 hours? I said them I am a outsource contractor and do job for some of my clients who live in USA and some other countries. They were asking how you do it? I mean that time in my country people very unaware about freelance job. But, now time has changed and people are aware about freelancing. Many new skilled and non skilled people like to do freelance job on internet. But, they do not know how to start work what is conception of freelancing etc? Many people, I faced in my office and out of office come to me for getting consultation. And always I tried to suggest my best to them. Most of them, ask me how much money can I earn each day? This question very common but feel me as he has no idea of freelance marketplace or online freelancing. And my reverse question to them how you feel about freelancing? Most them answer like for doing freelancing need a computer and internet connection and earning money will rolling? How fun look like it! My often question Why people thinking so? Really freelance or outsourcing is easy rather than 9 to 5 job? What is your best suggestion for newbie? Well they don't know whether to think it's easy or if it's hard because they don't know much about it. If anyone has to ask you how much money you make everyday from freelancing then they really don't know that much about it hence why they're asking. But what they do know is that unlike traditional job where you have to get up early, commute and work hard doing a job that's one where you're on your feet all day or even a boring office job or something 9-5 and 5-6 days a week with a boss breathing down your neck. You don't have to do that with freelancing. You can work from the comfort of your own home, be your own boss, set your own hours and not have a boss breathing down your neck all day long. And so as much as they don't know about freelancing, most people still know enough to know that it's easier than working a normal 9-5 job. However that's not to say that freelancing is easy and that it doesn't have its downsides. Because it can require a lot of hard work and putting in a lot of hours and being unsociable for long periods of time always staring into your computer screen. There are both pros and cons to working a 9-5 job and freelancing or being an affiliate or Internet marketer or blogger for example. This has already been covered before though AJ in other discussions which are well worth checking out. 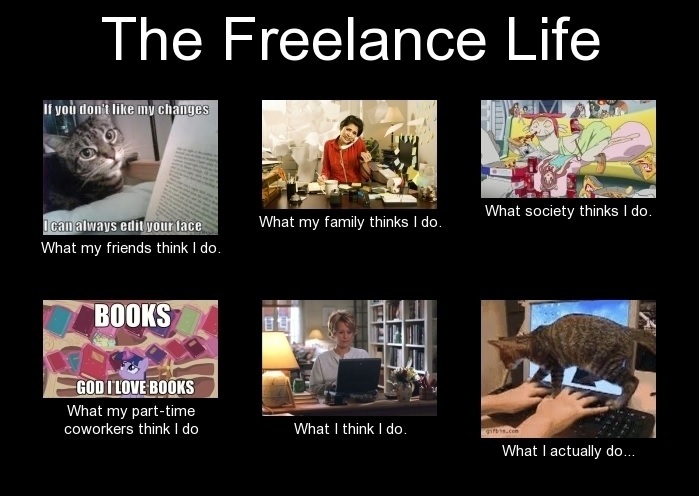 Life As a Freelancer: The Myths And Realities. The Top 5 Things Every Successful Business or Freelancer Needs to Do To Be Successful. HI Mike thanks for your replay and for nice explanation. I do agree with you. Yes sometimes people are asking so ordinary question due to no experience on such sector. Regarding Freelancing job many people has misconception. They just feel like that what I said in my topic. Just need to computer and internet connection than earning will rolling. And they may thinking as like fixed job as fixed salary basis. On the other side, freelance job not too easy for do and earning money, specially who has no experience on this sectors. 9 to 5 job or freelance job both has pros and cons. But anything not easy. I think that most people think that freelancing is an easy job because they know that most freelancers stay at home, and they envision them comfortable in their pyjamas typing away on their computer for a couple of hours a day, with a cup of coffee next to them and a cat on their lap. This could be quite true, but what they do not know is that most successful freelancers work long hours and put a lot of effort in their work to attract new clients and keep regular ones happy. I think some people think it is easier than it really is to freelance. I mean one thing I would not be able to do is to do so much work for so many people. It is almost like having a new boss 10 times a day! Each job you do has a new boss and I know some people can be really demanding. On the other side you can set your own hours and work around the needs of your family and the rest of your life. You can also work at your most productive time and not during normal working hours. I know some people work best late at night and are barely functional in the morning. I do think though that freelancers work really hard, plus there is not the guarantee of a salary like a normal job, so it has its ups and downs too. Oh man, I get asked all the time what I do for a living and what I've come up with as a canned response is "I work online helping out businesses with their websites. I basically help them get traffic." lol After I say that I always get "Well how do you do that?" and then they tend to zone out when I start talking about how to get a website traffic through search engine optimization and online marketing It's funny that they want to know, but they don't want to listen. I personally work online because I like the freedom of making my own schedule and not having to respond to a boss figure. I've worked online long enough to set up some passive income streams, and that's what my friends want but they won't put the time in to achieve it. A lot of people just want something handed to them rather than put the work and dedication into it. Freelancing is not easy job and not every body Job. Only those people who have excellent skill like S.E.O or social media marketing or android/iOS development or web designer/developer or graphic designer etc.If any person who doesn't have this skill then it is difficult to earn money from freelancing. It always get me angry when I see people think that it is easy to make it working on the internet. That's the reason many will be quick to join, but once they notice the stress and the amount of work being put into it, they always give up. So, I've made up my mind not to introduce anyone to freelancing unless I see real drive in such persons to make it by working on the internet. Over here, people think that you can earn big money from working in the internet if you have the skills particularly technical skills. Maybe because newspaper columnists are saying that when a successful blogger is featured. But I think those earning much in the internet are the lucky ones and generally the earnings is small. Well, wouldn't blame them because I use to think same until I started working myself,I think because it an all-comers affair.One does not really need much certificate or degree to do this, so people believe it has easy as it comes.But truthfully it isn't easy at all. Why do people want this? Why mostly people choose paypal for withdraw funds? why so many people are not giving feedback?